SECRETARY KELLY: Thanks very much. I want to make a few comments about a new initiative that will be made public now and then sitdown and take some questions. But thank you, Richard. The top I want to make comments on has to do with aviation security. I don’t have to tell anyone in the world that was alive then that since 9/11, the United States has seen a series of attempts on commercial aviation: A shoe bomber. Liquid explosives. An underwear bomber. A plot to detonate explosive cargo. Most of these were disrupted just in time and didn’t result in the tragedy that the terrorists were looking for. But, in 2015, ISIS claimed responsibility for the bombing of Metrojet Flight 9268, which killed all 224 people on board, and became the deadliest air disaster in Russia’s history. Terrorists want to bring down aircraft to instill fear, disrupt our economies, and undermine our way of life. And it works—which is why they still see aviation as the crown jewel target in their world. The threat has not diminished. In fact, I am concerned that we are seeing renewed interest on the part of terrorist groups to go after the aviation sector—from bombing aircraft to attacking airports on the ground, as we saw in Brussels and Istanbul. However, we are not standing on the sidelines while fanatics hatch new plots. The U.S. government is focused on deterring, detecting, and disrupting these threats. That is why in March I made the decision to ban electronic devices larger than a cell phone from the passenger cabins of U.S.-bound commercial flights from the ten airports in the Middle East and North Africa. I made this call based on evaluated intelligence and real concerns that I had about terrorist plotting. Make no mistake: our enemies are constantly working to find new methods for disguising explosives, recruiting insiders, and hijacking aircraft. I’ve made a point to talk with everyone I can about securing aviation. I’ve met with our international partners. I’ve met with our industry leaders. I’ve met with our private sector stakeholders. My conclusion is this: it is time that we raise the global baseline of aviation security. We cannot play international whack-a-mole with each new threat. Instead, we must put in place new measures across the board to keep the traveling public safe and make it harder for terrorists to succeed. Today, I am announcing a first step toward this goal by requiring new security measures to be applied to all commercial flights coming into the United States from abroad. These measures will be both seen and unseen, and they will be phased in over time. They will include enhanced screening of electronic devices, more thorough passenger vetting, and new measures designed to mitigate the potential threat of insider attacks. We will also lay out a clear path to encourage airlines and airports to adopt more sophisticated screening approaches, including better use of explosive detection canines and advanced checkpoint screening technology. Additionally, we will encourage more airports to become pre-clearance locations. This not only enhances security, it also increases convenience by allowing international travelers to go through Customs and Border security screening before boarding flights to the United States. With this announcement, we send a clear message that inaction is not an option. Those who choose not to cooperate or are slow to adopt these measures could be subject to other restrictions—including a ban on electronic devices on aircraft, or even a suspension of their flights to the United States. However, the indications are that all airlines will work with us to keep their aircraft, their crew, and their passengers safe. I have spent months engaging with our closest allies and foreign partners on this issue, and many of them have expressed strong support for this effort. While these actions we are announcing today will improve the security of U.S.-bound flights, I am hopeful other nations will follow suit. Unless we all raise our security standards, terrorists—who see commercial aviation as the greatest takedown—will find and attack the weakest link. Together, we have the opportunity to raise the baseline on aviation security globally, and we can do it in a manner that will not unduly inconvenience the flying public. Let me be clear: security is my number one concern. Our enemies are adaptive, and we have to be adaptive as well. A number of the measures we plan to put in place can be dialed up or down in a risk-based, intelligence-driven manner. And over the next several weeks and months, we’ll work with our partners to ensure these measures are fully implemented. Again, today is just the starting point. We are taking prudent steps to make aircraft more secure, to reduce insider threats, and to identify suspicious passengers. In the meantime, we will launch a concerted effort with our foreign partners to put in place wider counterterrorism improvements. This will include better information sharing, expanded exchanges of terrorist watch lists, and more advanced security checks of travelers around the world. Finally, let me commend all of the outstanding men and women throughout the Department who make aviation security their daily mission. Whether they are working on the front lines at the TSA checkpoint, developing better screening technology in the labs, or preparing the intelligence that helps us make tough decisions, every passenger owes them a debt of gratitude. 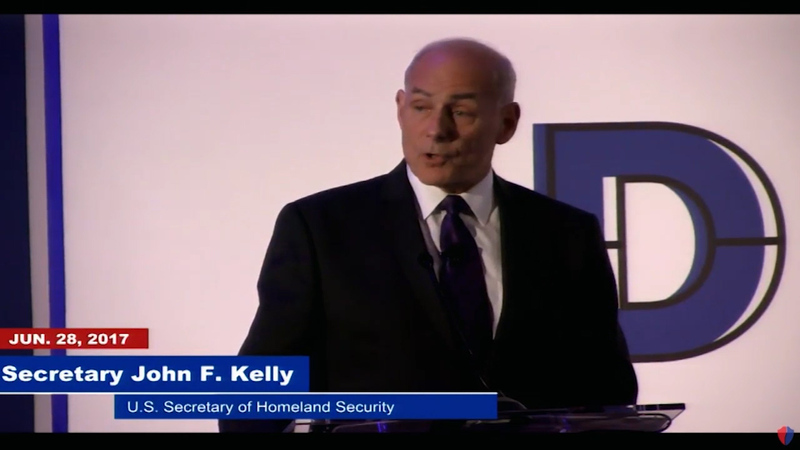 I am proud to lead them, and all of the DHS employees who make our nation more secure. I also want to thank our international partners and the airlines I have met with recently. We have had productive discussions about the threats we face, and I am encouraged by their effort to find solutions with us that will help elevate global security standards. Thank you for the invitation to speak today, Richard. I look forward to my conversation with you on this issue and on a full range of other issues so important to the American people. Thank you.